Why did only 100 jobs go to Singaporeans last year? If you’re happily employed, you probably didn’t realise that Singapore is undergoing a metamorphosis. It is an economical evolution and the effects of change will affect the entire country. Hiring in 2015 is barely visible. So when the reports say 31,800 more people here were employed at the end of last year….. but citizens and permanent residents made up only 100 of these, it makes sense. Our pool of workers is so small, businesses have to look elsewhere for essential manpower or cease to exist. This also means less new jobs are created in Singapore. 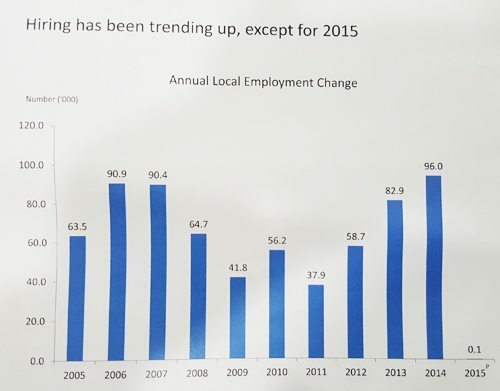 It is a structural change: our economy is not expanding as fast as before. The slowdown had been observed over the last few years. Today, the Ministry of Manpower announced that employment growth had been flat. You have probably noticed that the GDP numbers of late hasn’t been fantastic either. All in all, workforce expansion is muted. This probably doesn’t mean much to employees, but to business owners however the effects are felt very strongly. Businesses have shut because they either cannot get the manpower to do work, or it has become unprofitable to continue doing business because labour costs (amongst other sunken costs) have risen. You must note though that Salaries have increased by 6% at the median and bottom 20th percentile. This is good news for employees, but for employers this is worrying. If salary trends continue to rise without any real gain for the business, then it is not sustainable. If you take a walk to your favourite eating and shopping places, you might have noticed some have gone bust. You’ve probably heard of foreign colleagues having to leave the country because their employment passes/permits haven’t been renewed. All these are results of deliberate action by the government to steer Singapore away from becoming the cold, capitalist society we all fear we’re becoming. If left unmolested, the economy will launch on a trajectory that will take Singapore to a cold, capitalist hell. A millionaire’s underworld where foreigners will outnumber citizens, where there is much wealth but with less heart. Where utility and economic efficiency determine our lives with all the love and care of a washing machine. We are not yet like that today, far from it. 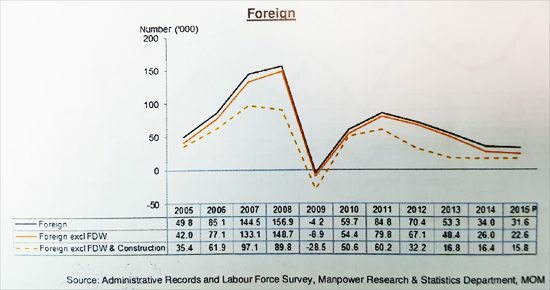 Employers from all sectors have kept calling for the government to stop tightening the belts on foreign manpower. The common complaint is that there are not enough workers in the Singapore pool to sustain their businesses. However, there is a limit to how much you can tighten a belt. The country will discover sooner or later that we’ll need to trim the fat off instead. All that unproductiveness and inefficiency from corporate Singapore require more manpower than is necessary. It is necessary now that businesses learn to manage resources, or let natural selection rear its ugly head and let these inefficient businesses die. When these resource hungry businesses cease, manpower is freed up for other more deserving companies. Perhaps. But this is the world of business – either you run faster or you get eaten. As long as Singapore is rich with companies and is able to keep the labour market tight and the retrenched can very easily find another job. Thank you, it was a well-intended article and I wish more people wrote of such topics. You seem to be suggesting that the government is trying to slow (regulate) economic growth. Doesn’t that run counter to their goal of increasing population to at least 6mil? Unless they intend them to be unemployed, of course. I don’t think this article convinces me that the sudden low employment change is a good thing, as much as I’ll like to believe it. Also, I believe more can be put into explaining the data presented (the source, and the fact that only 100 more citizens doesn’t mean only 100 citizens were hired). a.) 6.9m is the government’s planning parameter, not a target. They will use that number to determine how many trains, roads, buildings etc to build. b.) Just merely keeping the economy constant, in the short term, is going to need people. Businesses haven’t caught up with productivity yet and there are still many ineffective businesses hogging manpower. c.) More Singaporeans are needed not just for economical purposes. It is also required socially for a variety of reasons, the greying population is one of them. I’m not sure I buy it. Only 100 of us can meet the manpower needs? The article doesn’t back this up with facts by looking into which sectors the 31,700 foreigners were placed into. You do know that “100 jobs” does not mean “100 people” do you?